My emails are delayed in getting to their recipients. To create a new email, click in the top right corner of the screen. Enter the recipient's address in the To field or select the contact from the address book. As soon as you start typing the first letters of a name, surname, or email address, you will see a list of matching contacts. To search names or surnames, you can use Cyrillic instead of Latin characters and vice versa. For example, to send your Russian friend “Ivan Petrov” an email, you can start typing his name using the Latin “I” or the Cyrillic “И”. Recipients you have recently corresponded with will appear at the top of the list. Select the option Display often-used contacts when writing a message. Deselect the option Show sender and recipient names instead of email addresses. To move an address from the To field to another field (for example, Cc), drag the address you need by pressing and holding the left mouse button. You can send your message to several recipients at one time. To do this, enter several addresses separated by commas and spaces in the To field. For example: cheshire.katze@yandex.com, just.mad.hatter@yandex.com, just.white.rabbit@yandex.com. Note. One message can be sent to no more than 50 recipients in the Mail web interface and to no more than 35 in the mail program. If you have one main recipient and several optional recipients, type the main address in the To field and then type the remaining addresses in the Cc field. Every recipient will be able to see all the addresses entered in the To and Cc fields. If you want to hide certain addresses, then simply move them to the Bcc field. Attention. A recipient entered in the Bcc field may not get your email because some spam filters delete these types of emails. You can send a copy of your message to the recipient's mobile device, free of charge. Only one recipient should be listed in the To field. The SMS copy can only be sent to one phone number. You can't send a copy in an SMS to yourself. Click SMS in the To line (next to the recipient's name). If your mobile phone number is not linked to your mailbox, then you have to verify it first. If a contact's phone number is listed in your address book, then the number will be automatically copied to the SMS field. You can also manually enter a mobile number. Attention. Carefully check your data. Make sure that both the email address and the phone number belong to the same person. After you send the message, the recipient will receive an SMS with a link to a read-only copy of the message. To respond to the message or to view attachments, they will have to use the Yandex.Mail website, the mobile application, or the Yandex.Mail mobile interface. If you frequently send similar or identical messages (e.g., invitations or CVs), you can save them as templates. Unlike drafts, templates will not disappear once your message is sent. All templates are reusable, so you can easily compose template-based emails to your partners, colleagues, or friends. Click Create template, specify a subject, and then type the message body. You can also add an attachment here. Once the template is ready, click Save template. Now you can open the necessary template directly when composing a message. Just click the Template link and select one from the list. All templates you have created are stored in a separate subfolder in Drafts. They only contain the subject, attachments, and message body text (without recipients). The formatting toolbar lets you embolden or italicize text, change the color or font size, create bulleted or numbered lists, insert an image in your email, and more. Copy the image to the clipboard: for example, if you want an image from another site, right-click it and select Copy image. Open the compose an email page, right-click the place on this page where you want to insert the image, and click Paste. Drag and drop the image on the compose an email page. Note. If you drag and drop an image to the text box, the image will be inserted into the message body. If you drag and drop an image below the text box, it will be attached to the email. Click on the formatting toolbar above the text box. Enter a direct link to the image and click Add. When you write an email, all changes you make are automatically saved as a draft every 10 seconds. You can put aside an email you're writing and edit it later. To edit a draft, simply go to the Drafts folder and open the last saved version of your message. If you want to get a delivery notification, click (below the input field) before you send the email. Once the message is successfully delivered, a report will be sent to your mailbox. Attention. The report confirms that the email arrived in the recipient's mailbox, but does not tell you whether or not it was read. When you send an important message that needs a reply from a recipient, you can set up a reminder about resending this message. Just click (below the text box) before you send it. If your recipient does not respond in 5 days, you will receive a reminder to send the message again. To view all your messages that have not yet received a response, click under the list of folders. Click (below the text box). Enable the send <on> <at> option. Set the date and time when you want the message to be sent. Note. You can postpone sending your email for up to one year from the current date. Check if the email is in your Sent folder. If the email is not there, an error might have occurred while sending the email – try sending it again. If you have sent a message from your Yandex mailbox but it has been rejected by the recipient's mail server, you will get an automatic report from “Mailer-Daemon” with reasons for non-delivery and the name of the server which rejected passing the message to its destination. The automatic report will specify the reason for non-delivery in a short phrase. Message rejected See http://mail.google.com/support/bin/answer.py?answer=69585 for more information. The recipient's address is blocked by his or her mail service. Sorry, your message to <email> cannot be delivered. This account has been disabled or discontinued. User account disabled for being inactive. Your email has been returned because the intended recipient's email account has been suspended. The account must be re-activated to receive incoming messages. The recipient's mail server does not accept large messages. Yandex mail server is blacklisted. A “loop” was detected in sent messages. If you didn't receive a non-delivery report, it means that your email was successfully delivered to the recipient's mail service. Contact Support for that email service to figure out why the message was not delivered. Attach to your request the properties of the email that you sent. If you sent the email to a mailbox on Yandex and it didn't get there, you will get a non-delivery report from “Mailer-Daemon”. Note. If you sent the message from your Yandex mailbox and it was rejected by the recipient's mail server, you can view a list of possible causes in the article The email was sent, but it did not reach the recipient. The recipient's mailbox is full. This message means that a mail address belonging to another mail service was specified in the From field, but message collection to your Yandex mailbox from that box is not configured. 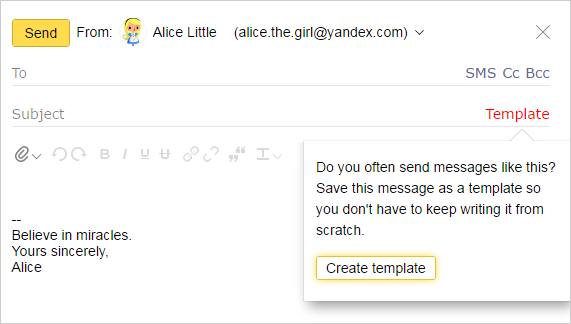 To send messages from an address on another mail service via Yandex.Mail, configure the fetcher to collect messages from that mailbox to your Yandex mailbox. If you get the error message Email can't be sent from login@mail.ru (login@gmail.com, login@yahoo.com, etc. ), it means that you tried to send an email on Yandex.Mail from your username on another mail service. Check that you have a fetcher configured from that mailbox to your Yandex mailbox. You cannot select an address on another mail service as an alias without a configured fetcher. Make sure that your complete address (not your username) is entered in your importer settings. For example, cheshire.katze@forestmail.com. To continue sending messages via Yandex.Mail, select your Yandex address in the From field (login@yandex.com). Emails that are generic or template-based are sent from your mailbox, and/or your emails contain commercial offers or ads. Yandex.Mail doesn't allow you to send these types of emails. Our service is intended for actual communication between people. Tip. If you want to send out mass emails to your partners or clients, please use our special mailing services. Every day a huge number of emails can be sent from your mailbox, which can be regarded as spam. The emails can be sent both with your involvement and without your knowing about it. In order to avoid this, Yandex has limits on emails sent per day. You can send up to 500 emails from one mailbox in a 24-hour period. If the email has several recipients, then each individual email sent counts separately towards your total. Note. Restrictions may be lifted if Spamoborona suspects that you are sending generic or template-based mass mailings, spam, ads, or commercial offers. You can send 3000 * emails from one mailbox in a 24-hour period. If you entered several recipients, then a separate email will be sent to each one. * Only external recipients are considered; owners of the mailboxes in this domain are not considered. Our security system flagged your account as suspicious. Usually this happens if you didn't link a phone number to your mailbox or a fake name was entered in your Yandex.Passport. Emails are sent to non-existent addresses. A large number of emails were sent to nonexistent addresses from your mailbox. If the message was sent to a non-existing address, you will receive an automated non-delivery report. We received several complaints from users about spam sent from your email address. In this case, attempts to send emails from your mailbox will be blocked. The block will only apply to attempts to send messages; you can still log in to your Yandex.Mail and get your emails. The block will be removed automatically in 24 hours if you don't attempt to send messages during that time. Otherwise it will remain for another 24 hours. Check your computer for viruses using free antivirus programs: CureIt! from Dr.Web and Virus Removal Tool“ from Kaspersky Lab ”. Then change your password. Enter your valid personal information on your Yandex.Passport page and link your phone number to your account on the Mobile numbers page. Note. If you use Yandex.Mail for domain, enter accurate information for all your domain mailboxes. Make sure the your recipients addresses are entered correctly and remain active. Make sure that recipients of your emails have voluntarily agreed to receive them. Delays can occur both on Yandex's servers and on the servers of your recipients. To determine where the delay occurred, write to our Tech Support using the form below. When filling out the form, include the properties of the delayed email from the recipient's mailbox.